_We invited designer and digital sculptor Jeremy Ortiz (@zbrushninja) to share his top tips on modeling for the Form 1+ 3D printer. I come from a traditional sculpting background using clay and wax. For me, using ZBrush simulates sculpting in these traditional materials so well that nearly of my traditional skills and techniques were directly translated into the digital medium. I was instantly hooked on this new medium of digital clay. As a digital designer, I knew if I wanted to be able to take my ZBrush sculptures into the real world, I needed a high resolution printer that could capture the fine details of my sculpts so I could use my prints as masters for molding or directly as one-off production prototypes. The Form 1+ is the only desktop 3D printer that offers a level of detail that could effectively and accurately reproduce my sculptures with a superior level of detail and quality that was on par with industrial stereolithography printers. All of that with a cost that was within my budget. Dragon Bust by Jeremy Ortiz, 3D printed in Grey Resin on the Form 1 +. It wasn’t until I was holding a 20mm tall dragon head print in my hand, with details so fine that it made pencil points, X-acto blades and fingerprints seems huge that it hit me just how powerful of a tool I had in my possession. 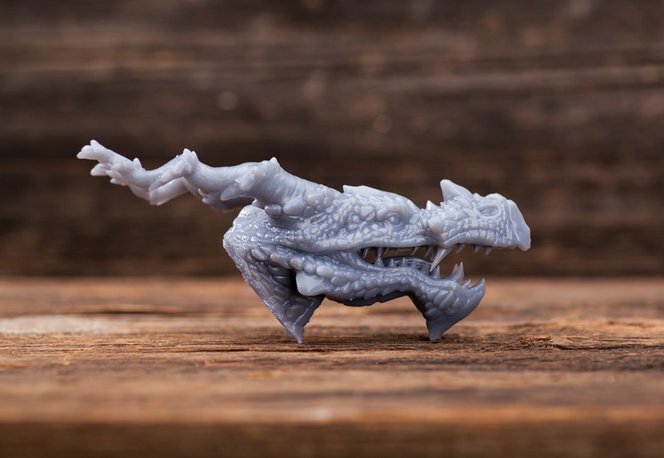 Here are 7 tips I have found helpful when designing and modeling for 3D prints. I personally use ZBrush and Maya for my work, but these tips should work on most 3D modeling software. For modelers coming from animation, illustration, or gaming backgrounds, one important thing to remember is that your 3D prints must be composed of watertight manifold volume parts. Always check your model for artifacts, loose faces or unwelding edges and verts. PreForm, Formlabs’ free downloadable 3D printing software, has automatic tools that ensures your model is watertight. Does my part need to be one continuous mesh? This is a question that many new modelers have when creating for 3D printing. The simple answer is that a continuous mesh is not required. You can design prints from overlapping or intersecting objects so long as all components involved are manifold parts. When designing your part, keep in mind your build area. However, your printer’s build volume does not have to limit the size of your final model. Be creative! Clever layout in your build area can help you get larger prints. For instance, the diagonal space from top to bottom in your build area will give you the longest build size of your printer. When sculpting small parts, it’s often very helpful to slightly exaggerate details. This means making your surface details with slightly deeper cuts and more pronounced surface texture. If possible, making slender parts slightly thicker will help ensure that they will print clean. Making your model hollow using shell and boolean functions available in your modeling software will save you resin material. Be sure to make a large enough “vent hole” that connects to your hollowed area to the outside of your model this will allow uncured material to flow out. After your print is finished you have to soak your finished print in IPA for 12-15 minutes. I find that towards the end of the soak you can give your part a gentle rubdown with your gloved hand to help break down and remove any resin stuck to the surface of your print. Using a soft brush also helps to reach area that you can’t reach with your hand, this added step this helps get a quality finish to your print. Take your time when removing your support material. Rushing this process could ruin an otherwise flawless print. Using an X-acto knife to score a line at the connection point will give a cleaner break. Give thicker supports a gentle wiggle, don’t pull or use excessive force.